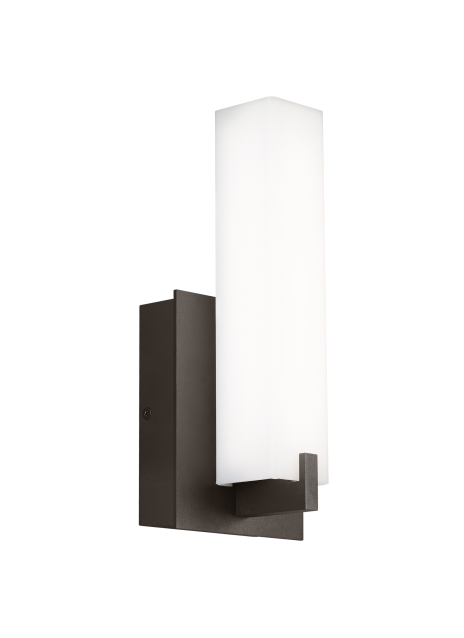 The elegant, contemporary Cosmo LED outdoor wall sconce by Tech Lighting features a rectilinear white acrylic shade with metal base. Cosmo creates soft up light to highlight structural features on an architectural facade as well as creating subtle ambient way-finding. Ideal for residential, hospitality, or commercial applications, the contemporary profile of the Cosmo design is available in two sizes (12 inches or 18 inches square). This unique outdoor light fixture features a durable, marine grade powder coat finish available in either Charcoal or Bronze. Cosmo features stainless steel hardware and impact-resistant, UV stabilized frosted acrylic lensing for added durability and stability.